Samsung U600 comes in as the new Samsung’s range flagship, being a top-notch solution in every way. 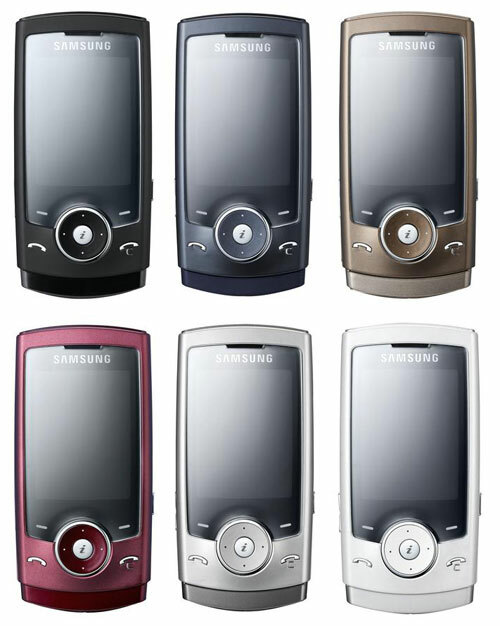 The Ultra II line-up comprises four models Samsung U100, Samsung U300, Samsung U600, and Samsung U700. One would naturally see the flagship in the U700, or, at least, this is what the model’s index suggests. But it is not that simple. The company puts much effort into separating its models for 3G and phones for 2.75G, in other words those working on EDGE-enabled GSM networks. Historically, Samsung runs two mobile phone development centers – Gumi and Suwon, which propose different hardware solutions that handsets build upon. Thus, models created in different units may share looks, but delve deeper and you will find fundamental differences, as they follow different philosophy. 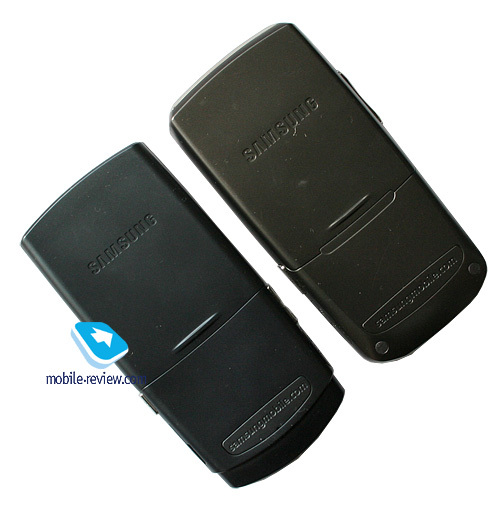 This case is no exception – it would seem that Samsung U600 and Samsung U700 are set apart only by UMTS support and HSDPA high-speed data for the senior model, however on closer examination the list of differences is far from complete. The Samsung U700 has no built-in FM-radio, yet packs WheelClick, the navigation wheel, that feel convenient while browsing the menus and scrolling through the music library. 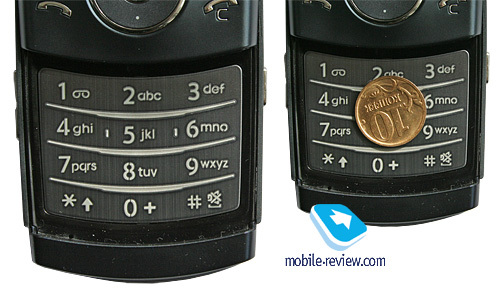 This wheel takes up the place of the navigation key implemented in the Samsung U600. It also proves to be thicker – 12.1 mm, while the U600 comes in at 10.9 mm thick. This has allowed the vendor to keep the same camera module used in the Samsung D900/D900i, whereas the U600 employs a sensor of different type with a tad worse specs. 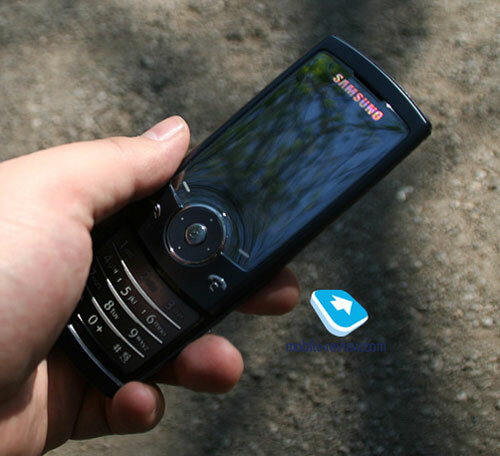 The distinctions in software are numerous, but at the end of the day, it seems more interesting in the Samsung U600, however those routine, daily activities run smoother with the U700 (for example, contacts can be sorted by fist and last name). Also, don’t forget the U700’s enhanced phonebook, where the general list now sports a reserved spot for called ID, whereas previously it was available only from the detailed view. Now everything is so much simpler – you highlight the entry and see the assigned picture, if any. Entering e-mail address has become a more gratifying experience with a simple yet smart solution. What is the char we always bunch in? Right, it is @. Now, what is the point in wasting time on typing it over and over again? The manufacturer has simply divided the field into two – before “@” and after. A perfect solution – I don’t know why nobody could come up with this earlier. Profiles. 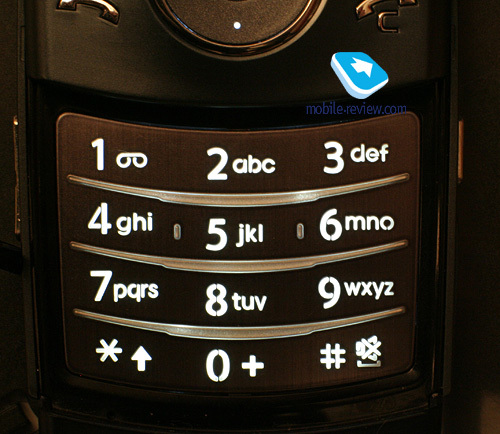 All handsets have adequate profiles, at that their settings utilize tabbed interface, meaning that the first tab serves for managing calls, second – messages (tune can vary by profile!!! ), third – for phone’s own tones. Seemingly, why don’t we let these differences just be and dub the Samsung U700 as the flagship? The second reason lies in the situation on the European market. Samsung has Russia as its main target market for GSM/UMTS-devices (which makes up about 20-25 percent share of all European sales), the company does well in Italy, France and a couple of small East European countries. The most important contracts in Western Europe rely on promoting operators’ handsets, rather than the open market. The UMTS portfolios of operators give preferences to products by Nokia, Sony Ericsson, Windows Mobile smartphones The reason here is quite obvious – as a rule the users of such devices turn to data connections more often, try new services, upload new applications wirelessly, in other words, bring profit to the operator. And when pushing 3G services this is what makes the difference. Samsung-branded phones today don’t offer such abilities for extra operator traffic generation, and thus prove to be paying only when proposed as ordinary GSM-handsets or cheap, low-end UMTS-solutions. 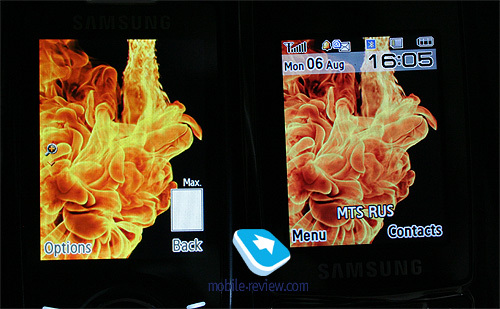 Incidentally, such express launch of the F-range and reincarnation of the Symbian-devices branch, are all the links of one chain – Samsung is trying to offer the operators exactly the products they want to see. 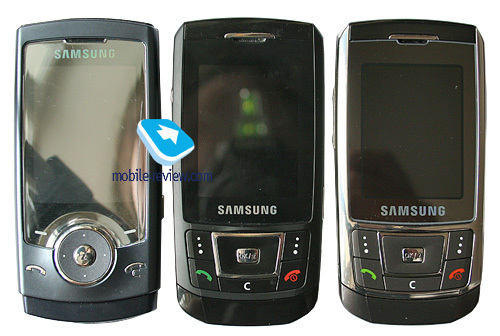 Hence, the real flagship that is going to be highly demanded is the Samsung U600. At that, thanks to both the selection of markets and their shares and the technological talent. 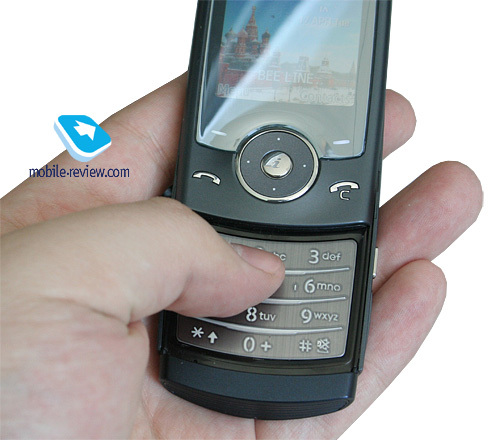 For example, the Russian market will never see the Samsung U700, and even if it makes it, then this handset will be available exclusively from one distributor. For this model the manufacturer provides 7 different color schemes - Sapphire Blue, Crystal Blue, Platinum Metal, Copper Gold, Garnet Red, Neutral White, Soft Black. Though initially it will come in Sapphire Blue, then some more colors will arrive, probably, the red for women and black for men will be in the first wave. 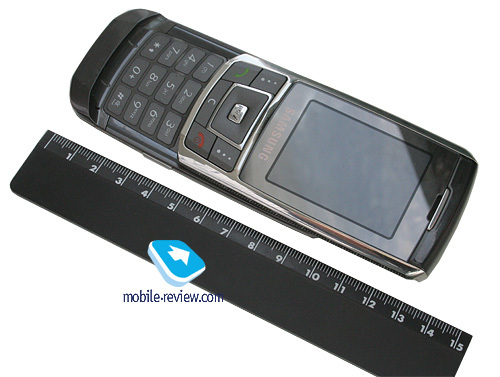 The handset measures in at 103x49.3x10.9 mm, being even slimmer than the Samsung D900, which comes in at 12.9 mm deep. Technically, if you put these two one over another, you won’t spot much of a difference, as their sizes are roughly equal, while the win in thickness is not so eye-catching. Yet more petite dimensions do the job, lending the Samsung U600 a more elegant looks, with the touch-sensitive keypad adding even more gloss. Slid-closed, the devices appears quite offbeat. The handset weighs in at a mere 80 grams, which is a remarkable achievement for a slider packing so much inside. You can carry the device anywhere you like – there are no limitations on that – it readily slips even into the jeans coin pocket. The phone’s design is by no means standing out among all models of the company that have made it to the market. The design cues, certain curves are very discernible, but you won’t be able to tell that the device three meters away is the U600 for sure. This is neither bad nor good. 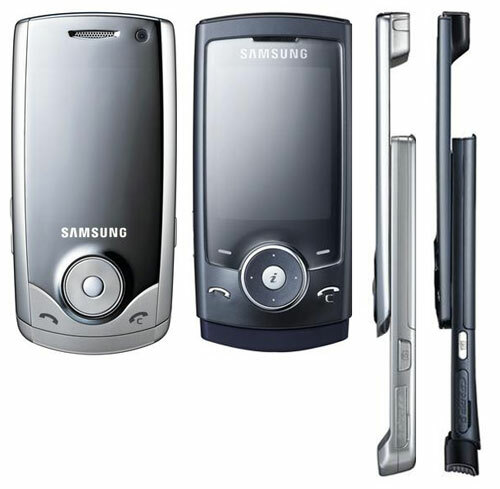 On the fact of it, the model is a slim and not quite catchy slider (unless you own a red-colored device, even though it can be easily confused with the Samsung E900). The slider comes equipped with spring-loaded slide mechanism, but due to the phone’s size, the slide action feels somewhat stiff, not as smooth as we would like it to be. Your finger ends up resting on the display’s, inevitably leaving prints on it. With time, the U600 starts rustling a bit when sliding it open (it took our unit three weeks to come to that), though, this doesn’t affect the handset’s abilities in any way. 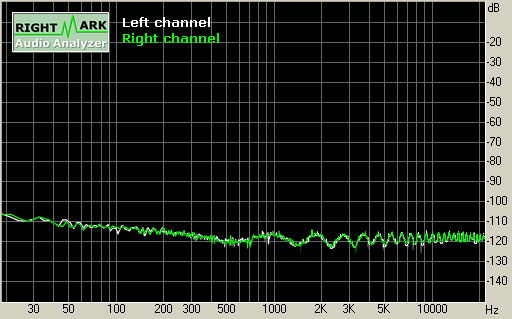 The runners of the Samsung D900 picked up the same sound after some quality time with it as well. As the developers intended, slightly protruding navigation key should have been the thumbgrip, but in practice nothing like that happens, as this is not particularly handy for reasons of anatomy. The left flank plays host to the volume rocker, though it has been moved to the very bottom – anyway, it wouldn’t have fitted in its usual place due to the casing’s thickness and detachable battery. From the standpoint of ergonomics, this is not just a “questionable” solution – it everything you mean by “inconvenient”, pushing the button during a call is quite challenging (if the U600 is slid open, when closed it is nothing out of this world). But the truth is, you won’t need this function too often. Right here, hidden under the plastic flap linked to the casing is the charger socket, that readily accepts a USB data cable or a headset. Flipping over to the U600’s right spine, you will find the dedicated camera button, topping the hot-swappable microSD memory expansion slot. Looking at the top edge you will find the power button, while the opposite end houses the microphone. The device has nothing against being used both in closed and open states. Those who take Samsung U600 in their hands for the first time get totally different impressions of its screen; the opinions are ranging from love to hate. 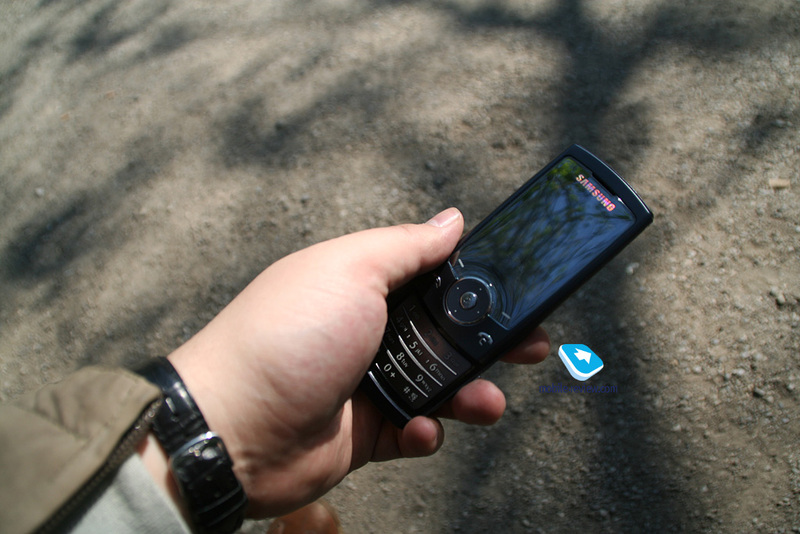 The reason for that is which light conditions people play around with the handset in; so when outdoors you get a negative feeling, indoors – positive. 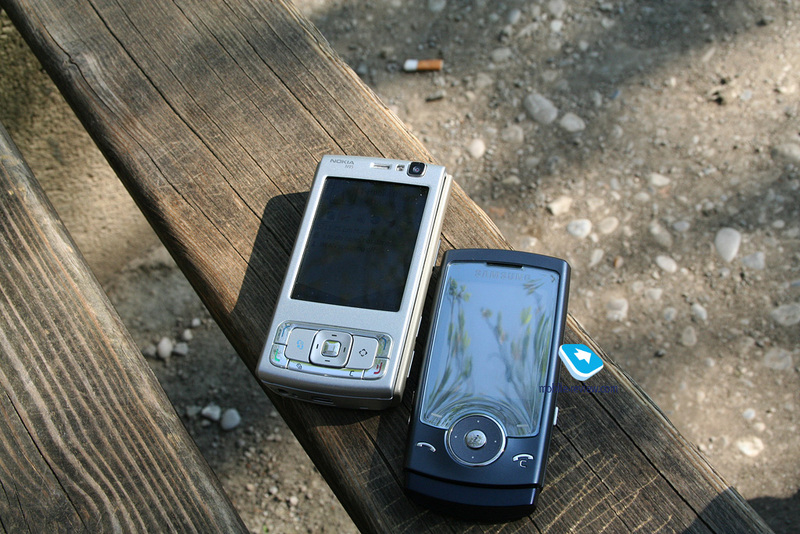 The plastic covering the screen possesses glossy mercury surface which makes the design look off-beat and modern, like in Sony Ericsson Z310i, Z610i and a number of other models. To put it simply, this is a fashionable trend. 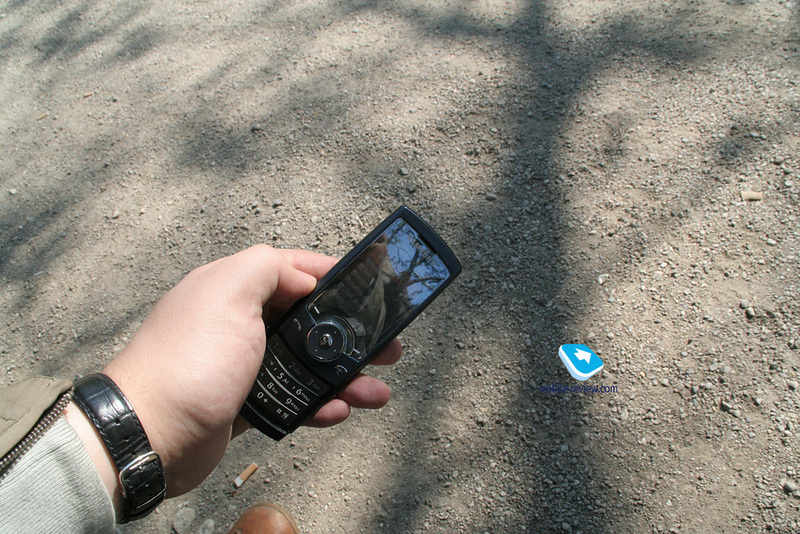 But from the user’s point of view such choice isn’t quite reasonable, in the bright sun the screen starts glaring, and it is difficult to find a proper angle. Sky, your face, trees around you, all these things reflect in the handset, but not the information that should be visible instead. The developers were conscious of this problem and added Sunlight mode function. You activate this option in the settings and the screen contrast grows up (subjectively by one level if the scale was longer). Within Ultra II range this mode is available on all devices whether they have this kind of protective glass or not. Though, it is not recommended to use Sunlight mode as the battery life time decreases by about 10% in this case. 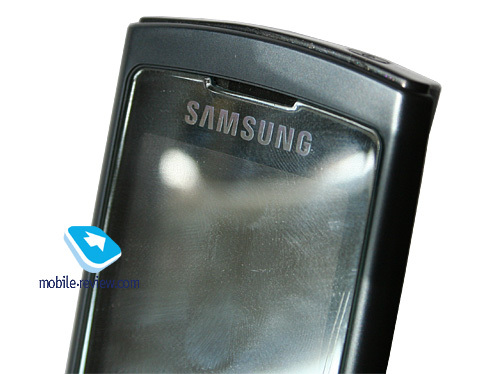 Another change, when comparing the U600 with the Samsung D900, is more durable plastic the screen is clad in. The number of the D900 display’s mechanical breakdowns insignificantly increased as against the previous sliders, which is explained by insufficient display protection. You can make sure of this if you look at the place where the protective plastic is right against your finger when you are sliding the handset open. Stains appearing on the display indicate that mechanical effect on the matrix took place. Thus in daily use killing the display is next to impossible, but should you squeeze it in jeans pocket (in the back one, of course), the display will say goodbye to you. Let me say that this problem isn’t epidemic; increased rejects rate amounts to tenths of percent, but in the new flagship the manufacturer has decided on avoiding even a hint of such things. The screen specifications are typical for the top company’s offerings – QVGA resolution (240x320 pixels), 2.22” (34x44mm) from corner to corner, 262000 K colors (TFT). 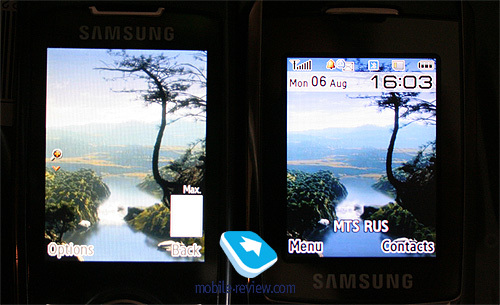 Comparing with the Samsung D900, the win in size is insignificant, as that model sports a 2.1-inch display (33x41mm). In fact you won’t even notice this change. Quite another thing, though, is the picture quality. Indoors the Samsung U600 is undoubtedly second to none (Sunlight Mode turned off); picture brightness and contrast are higher, it looks brighter but colors are more natural, vivid. I’m not sure whether snaps can truly share this feel with you but putting the two handsets side-by-side you will notice the U600’s superiority. You should also keep in mind that it is not many times better, and in truth the displays these handsets sport are quite comparable, the U600’s display seems to be only a tad better. In the sun the Samsung D900 is definitely at advantage in terms of legibility. 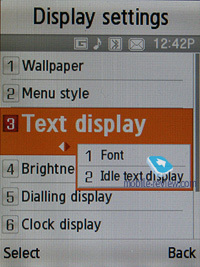 In Settings menu you may choose fonts of two types, the differences between them are minimal. 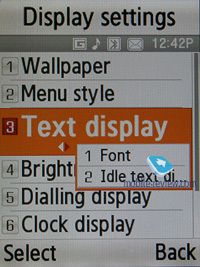 At the same time for all handset sections you can choose one of the three sizes of any font – small, medium, large. Your choice will have an impact on menu legibility, although the number of items displayed on the screen will not change, there were six and six will remain. A handy function which makes information easier to ready to any user. 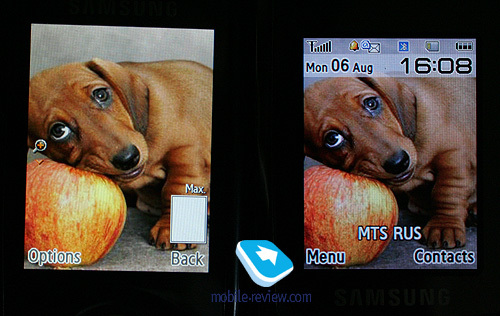 Starting with the Samsung D900 onwards, the capability of text scaling for incoming messages is present, employing the same concept as Piscel Viewer. The text instantly gets zoomed-in on or out at that even people with serious eye injuries can make out the letters at maximum font size. 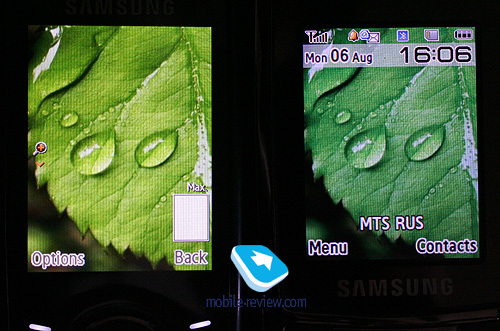 To indicate this mode, the Samsung U600 had a magnifier icon added, for the purposes of scaling the side volume button is used. 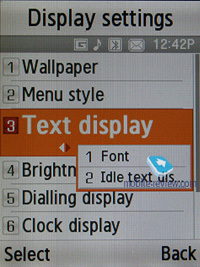 This function has no counterparts among the handsets by other manufacturers. In terms of legibility, today Samsung’s displays are among the best, the U600’s display accommodates up to 12 text lines (though in most modes - about 8 text lines and up to 3 service lines). 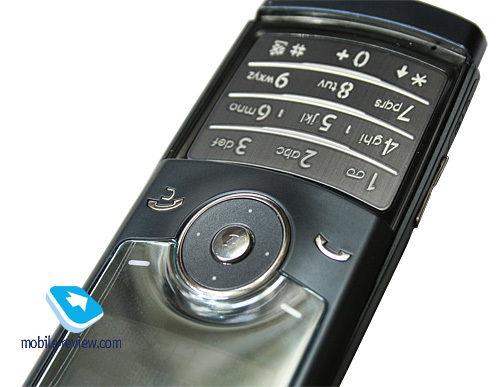 The main numeric pad is designed after RAZR, being a slim metal plate. Tapping the keys gives you some tactile feedback, this front delivers no problems, making the keypad quite comfortable to use. The keys are lit in bright white, which is visible in various environments. The soft keys, as well as the call receive/reject buttons are made touch-sensitive. 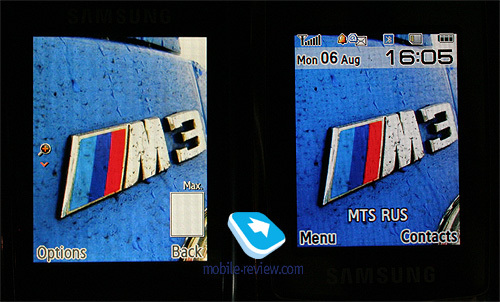 It’s rather an attempt to follow the latest fashion, than a real necessity; the fact of the matter is that such keys are popular in Korea and manufacturer has deemed that they would be coveted in other countries as well, Samsung E900’s experience, however, proves just the opposite. The backlighting is spread only to the soft-keys, while the call receive/reject buttons are not illuminated at all. While using the device, you should only get a grip on it to make the left soft-key trigger – and this is not a rare occasion. 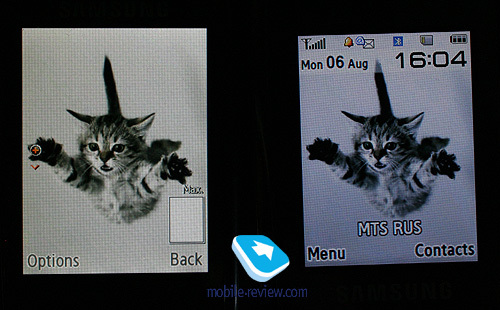 As against the Samsung E900, the number of wrong presses is higher “thanks” to the trimmed millimeters. At that the sensors here are very responsive. It is the touch-keys that top the handset’s list of shortcomings - their implementation leaves much to be desired, and they are everything but a cinch to use. 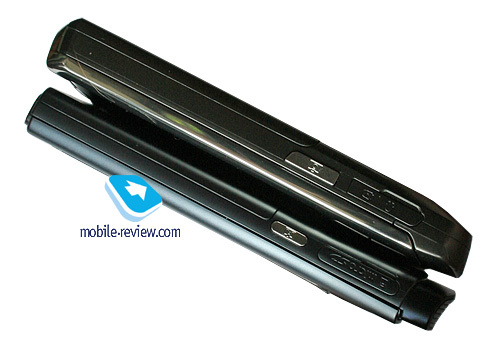 In view of the Samsung U600 690 mAh Li-Ion battery, whereas most Samsung-branded phones employ 800 mAh units, now is our chance to carry out a credible comparison, with, say, the Samsung D900, taken as the benchmark. Some oddities are revealed right after looking at the table of quoted battery life. Take a look for yourself. We saw the gap of 15 minutes, but by no means an hour. Then the things got even more interesting. 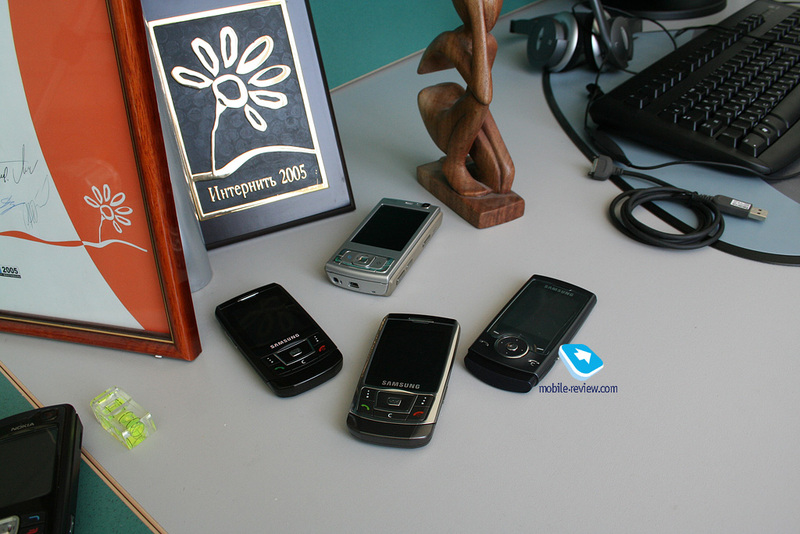 At 50 minutes of calls and up to 1 hours of other functions usage (music, radio), up to 15 messages, about 10 minutes of GPRS/EDGE-connections, the handsets displayed very uneven figures. So, the Samsung D900i, put into the German networks (roaming, similarly to the U600, meaning that there was tons of re-registrations), lasted for about three days, whereas the Samsung U600 stayed online for two days (one night short of, though) and then started crying out for some juice. In conditions of Moscow networks the Samsung D900 put up two days of operations at identical load, while the U600 gave us only 1,5 days. To me, this gap is significant, as it shows the real difference between the battery life times of these devices. The crux for the Samsung U600 is really not active use of its functions (with some reservations, of course), but the standby time and wrong responses of the touch-sensitive keys, which increases overall in-use time. If you will get heavier on its features for a day, this almost won’t affect the battery – one day is what this cell phone can put up in any mode. 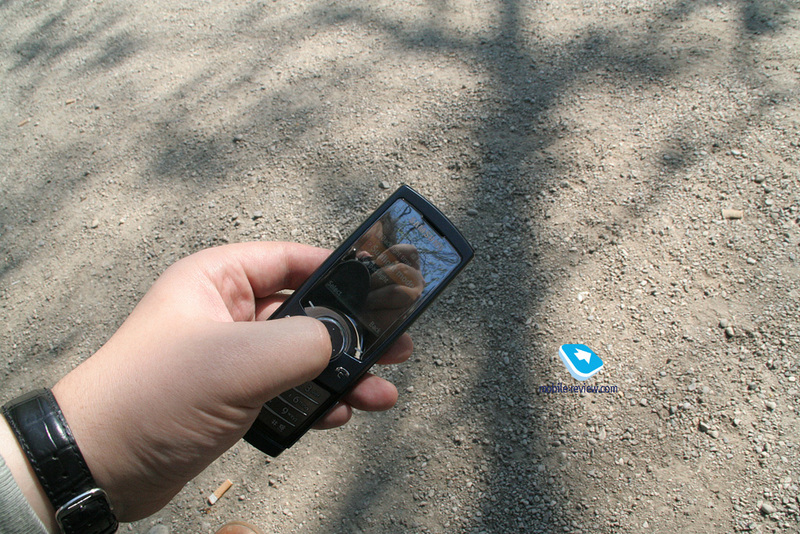 For example, video playback is the most power-hungry process as of today, and the U600 can play video for 3-3,5 hours straight (handsfree mode, or connected headphones). In radio mode, it will last 13 hours; used as an MP3-player with shuffle on, top volume settings and headset plugged in – up to 11 hours. These are tidy numbers that have been achieved mainly thanks to the CPU frequency – 85 MHz. Having shrunk the rate from 104 MHz to 85 MHz, the manufacturer has acquired that win of 10%. Bluntly speaking, this is how the matters stand, but in real life many other factors have their own impact on the battery life. Regrettably, Samsung Optimized Power Usage Solution (OPUS) technology is nothing but a marketing trick – we failed in squeezing good numbers from the U600 with this inside. The technology’s description is not available in any open sources, and the maker’s official page mentions it only in the press-release on the ULTRA II. Lack of information on what and how OPUS works indicates either its fictitious nature or mediocre efficiency, being all another way to struggle against the reputation of short-living devices. From the perspective of PR this is a pretty good move – thankfully, all resources dealing with mobile phones to a greater or lesser extent feature some lines about this technology. 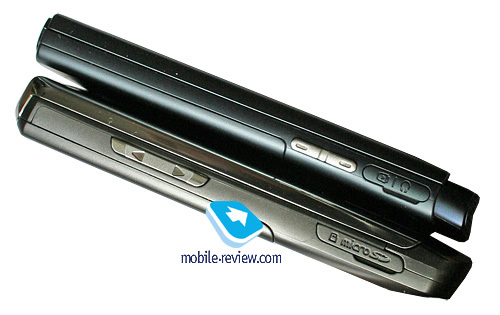 On balance, we get one day of stable operation for Samsung U600, or two days for those who spend little time hanging on the phone or nearly leaves out advanced functionality of the device. The music talent is getting to be one of the most craved aspects in the today’s mobile phones, so it is not a coincidence that promoting the UTLRA II range, Samsung quotes a generous selection of applied technologies, including the audio amplified by Bang&Olufsen. Up until today, these two companies have been known for partnership in designing the Serene, which was a complete bust. The next model scheduled for release this year, about at the same time as the predecessor, flaunts even more sophisticated design, though using this device in real-life doesn’t seem possible (unless you are a designer edition of a human with quite odd anatomy). 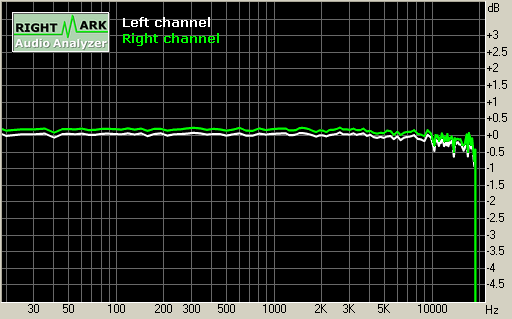 Right Mark Analyzer makes it crystal clear that the sound output by the Samsung F300 and the Samsung U600 is identical; on top of that the U600’s results are even better. After all, it turns out to be superior to Walkman handsets in terms of sonic experience and way ahead of S60-based devices by Nokia (saving for Nokia N91). But by this we mean the ideal case, when using own headphones via a quality adapter. It’s a shame, though, that none of such is available, the music-headset by Samsung with mini-jack mounted on them comes only in over variation. The bundled headphones you get out of the box are worse (no 3.5 mm audio jack on them), so it all comes down to an interesting conclusion. The company has prepared a solution that could have got in line with the best music-minded phones to date (not players, which are in a league of their own), but has missed out such tiny detail as accessories. The handset delivers good sonic experience with Samsung F300’s headphones (beating Walkman’s level) plugged in, so you have to get this kind of headset if you are planning on listening to music with the Samsung U600. In future all the makings of a competent music phone might come together in Samsung, which will result in a very fetching product, or even a whole line-up. When attempting to send a file to the device from PC (ftp connection), an error (Widcomm or Microsoft driver) occurs quite often. Another negative aspect is the fact that captions to the soft keys are usually not activated on the screen, thus you have to go through the hassle of pressing the side-mounted volume button in order to bring up a caption so that you could receive a file. As for the rest, Bluetooth works properly. USB-connection. In menu you may select one of three modes: Modem, Mass Storage, Samsung PC Studio While in USB Mass Storage, the U600 shows up on the desktop without having to install any additional drivers, so right after plugging it’s ready to work. Even though it is USB 2.0i, data connection speed tops out at only 480 Kb/s. The handset supports microSD memory cards up to 2 Gb in size, hot swap is also enabled. It is almost for sure that the device will not be able to recognize bigger cards, which is caused by certain problems with initialization of the more capacious units. 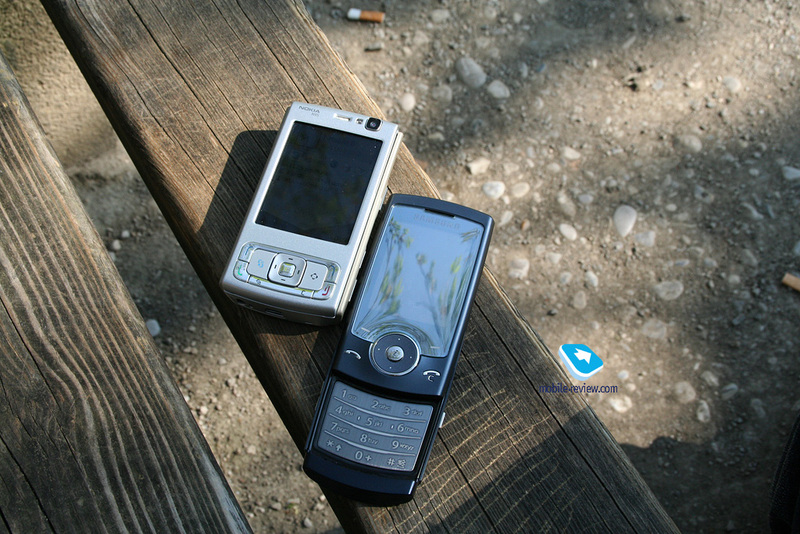 The handset experiences some problems with reading cards which already have their data formatted on PC or another handset. Quite often the installation of such memory card causes the handset to freeze, at that a reset doesn’t resolve the problem, at card initialization stage the system notifies of an error, being unable to read the contents. The larger card size gets and the more files it stores, the higher the probability of having problems with it is. It seems that interface speed isn’t sufficient for processing file index on the card, but we have no documents proving that. 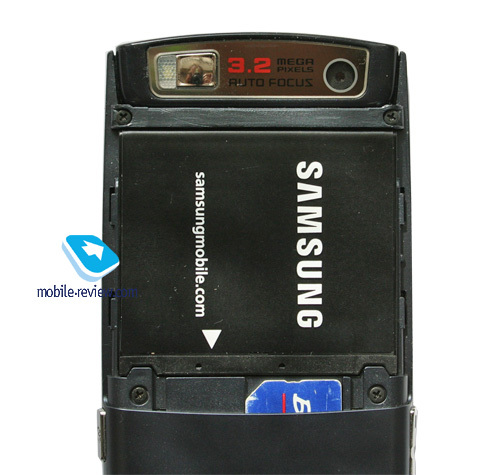 A piece of advice to the Samsung U600 users: format memory card on the handset, stick to the standard folders (however you may create your own folders), and don’t overload the memory card with tons of files. Java MIDP 2.0 – up to 10 folders for games and applications, up to 40 applications, midlet size 700 Kb, heap – 1.5 Mb. The performance turned out to be in line with Samsung-branded phones and devices released roughly two years ago. 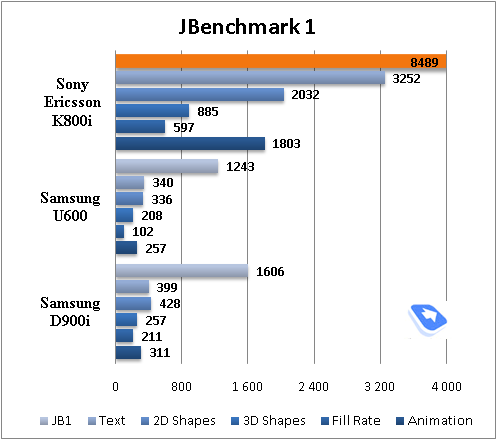 Unlike the Samsung D900 3D Java is supported, but it is sluggish due to the feeble CPU. 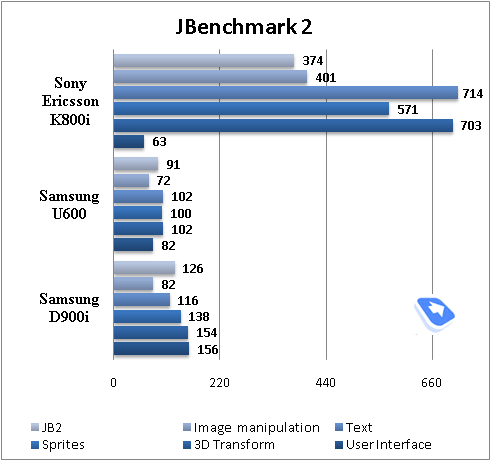 For the time being Samsung-branded handsets are remarkable for the least capable Java performance. In the next installment we are delving into the music player, software features and many other things. Stay tuned!